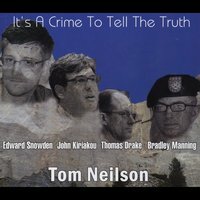 In Tom's satirical style, "It's A Crime To Tell The Truth" highlights the 'criminality' of speaking truth to power; plus other cultural idiosyncracies. Wars happen because lies are told about them. Lies are told about past wars. As Monsanto makes food policy with its ties to the White House and Cabinet, our food supply is put in a precarious position with lies about glyphosate and the consequences of genetic modification. Our potable water is threatened by gas and oil drilling, mountain top removal, radioactive waste, agricultural poisons, and climate change. Radiation levels from Fukushima are covered up while 2.5 years of radioactive waste fill up the Pacific and pollute our air, food and water. It is the end of the world as we know it because lies are told about the destruction of our natural resources and people - all so that a few can make billions off the spoilage. 98% of the voters voted for the above violations in the 2012 election. In Orwellian faux-patriotism, mass murder is honorable; “drones save lives;” “it isn’t torture unless there is organ failure;” annulling civil liberties keeps us safe and protects our freedoms; non-Wall Street candidates are “a threat to democracy.” Barack Obama, a constitutional law professor, tells the Yemeni government to keep a Yemeni journalist in jail, seemingly for reporting US drone attacks. “Guardian” newspaper computers are ordered destroyed by the government. Partners of journalists are detained at borders and harassed under ‘anti-terrorism’ laws. Journalists’ phone records, lap tops, and cell phones are confiscated. Whistleblowers reporting lies, waste, corruption, and abuse are arrested in record numbers, but Obama says they are not whistleblowers rather, traitors and criminals. We have attained a state of perpetual war, streamlined assassinations, and zero privacy of electronic communication. As Jeremy Scahill says, “The world is a battle ground,” and the Obama administration has arrested more people under the 1917 Espionage Act than all his predecessors combined. We are all journalists now, and it is a crime to tell the truth.